Do you love the finer things in your life? 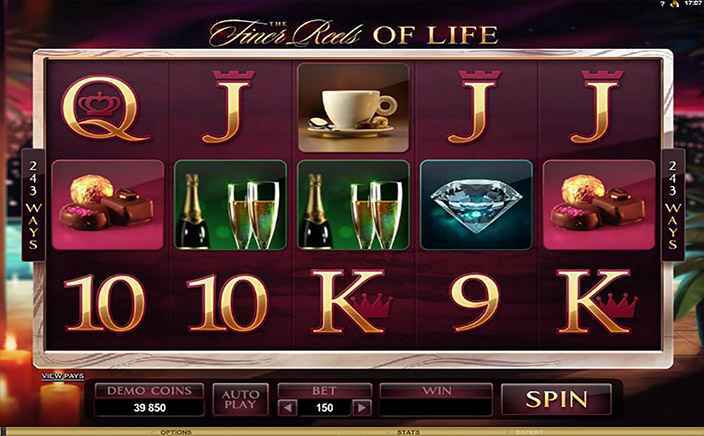 Well, then make a spin or two on The Finer Reels of Life, a luxuriously themed slot from Microgaming. This amazing slot offers 243 ways for achieving the wins over five reels by using its lots of nasty and tasty bonus features. The players, if lucky, might be able to treat themselves with real-life luxury and lots of comforts. This slot has an RTP of 95.03%. Before players indulge in these perks for richness in The Finer Reels of Life, they need to alter their bets. They can do so by clicking on the “Bet” icon after which a drop-down gets open offering them to set the number of coins and size they wish to play per payline. The coin denomination ranges from £0.01 to £0.05 per payline. Visually, this slot is tinged with a tropical backdrop with reels embedded in the polished wood. The low-value icons are portrayed by the gold playing cards. While, the high-value icons are a cup of coffee, luxury chocolates, a cigar and whisky, cheese and wine, champagne and a diamond. The Finer Reels of Life logo portrays the wild icon and can substitute all other icons except for the scatter icon i.e. gold bonus star. This feature is randomly awarded and will turn up to 5 reels wild at any point in the standard gameplay i.e. longer the players play, more will be the chances that they will get to play this bonus round. If players land a win that includes a wild icon, they will be offered a prize which may be equal to the 2x multiplier. 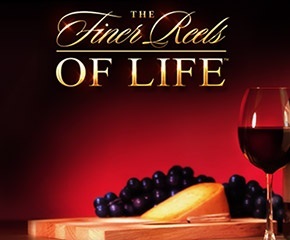 The Finer Reels of Life is an amazing slot released by Microgaming. It has an attractive outlay with lots of exciting bonus features which will surely attract players at large stake. One can earn as huge as 1500 coins in gameplay.